We've got some new images from the Hellboy reboot to go along with the recently released teaser trailer. Lionsgate decided to drop the trailer a day early, following some leaks online. Either way, we now have a much better idea what to expect from this new take on the long-running Dark Horse Comics series and it may not quite be what everyone was expecting. It's going to be a monster-filled, light in tone, yet dark and R-rated romp. And now we have our best look yet at the movie's big bad, the Blood Queen. 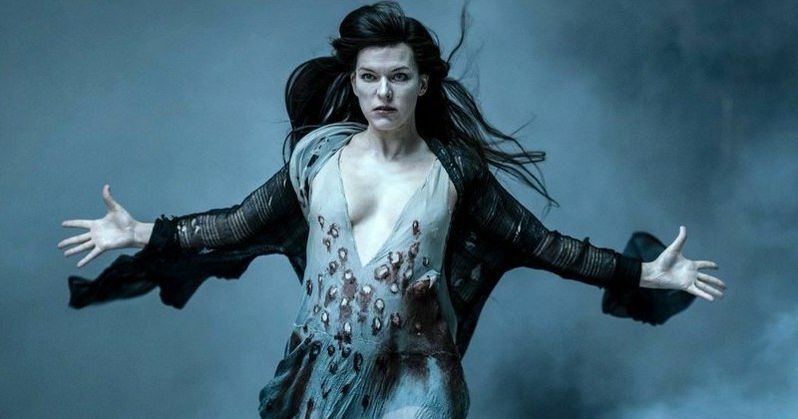 The teaser trailer was loaded to the brim with monsters and baddies of all shapes and sizes, but there wasn't a ton of Milla Jovovich as the Blood Queen and there was so much going on that what we do see of her in the footage is tough to hone in on. But this new still offers a great look at her character, who looks rather epic, in a word. Clouds behind her, the Blood Queen is rising in Biblical fashion, cloaked in stark grey and black clothing, dark hair flowing. A very not-messing-around face plastered on Jovovich. Hellboy may be big, but she looks menacing. Lionsgate also released another image featuring some of the supporting members who will be working with Big Red in the reboot. Daniel Dae Kim as Ben Daimio and Sasha Lane as Alice Monaghan both stroll alongside David Harbour as Hellboy in a hallway, with Kim looking particularly roughed up. Originally, the role of Ben Daimio was given to Ed Skrein of Deadpool fame, but following the whitewashing controversy that followed, he chose to give up the role so that an Asian actor could take the part. Not long after, Kim was brought in and, based on what we see here and in the trailer, it looks like they made a good call. With Marvel locked up by Disney and Warner Bros. in control of DC, other studios in Hollywood are doing what they can to get in on the comic book movie game. That means turning to properties that are perhaps lesser-known to the general public. In this case, Hellboy does have something of a history, as Guillermo del Toro directed a pair of movies based on Mike Mignola's creation in the early 2000s. For years, del Toro and actor Ron Perlman, who portrayed the character in those two movies, were trying to get a third movie made. But the reboot wounding up getting the green light instead. And that's the situation we find ourselves in now. Neil Marshall, known for his horror movie The Descent and his work on Game of Thrones, is in the director's chair. Lionsgate has hopes that this could turn into a major franchise for them. But before they can pop the champagne, they've got to see if audiences will turn up to see the new Hellboy when it hits theaters on April 12, 2019. Be sure to check out the new images from the Hellboy Twitter account below.